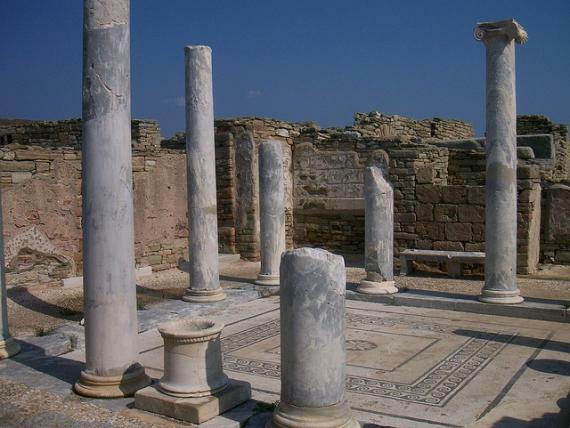 The museum includes six rooms and here are collection of sculptures and tombs of Rinia but also important finds from excavations in Mykonos. The rich collection of ceramics, is representative of Cycladic pottery. The collection of pottery includes vases of workshops in Cyclades dated from 9th and 8th century BC. The most famous exhibit is the burial pithamphora with reliefs of the fall of Troy, in room E. At the same floor visitors can also admire Melian pottery, black figured vases of Ionia and two large matrimonial boilers. In Room D exposed tombstones from Rinia of which stands out the column of Tertias Orarias. In room A there are pots of Mykonos, miniatures, jewelry and weapons.At the porch placed tombstones, statues, inscriptions and a sarcophagus from Rinia. The museum is open daily (except Mondays)8:30 to 15:00. Tel.22890-22325.